EghtesadOnline: Members of Commonwealth of Independent States (CIS) along with representatives from other countries including Iran and officials from the International Telecommunication Union converged in Ashgabat on Oct. 9-10 to discuss collaboration in information and communication technologies. 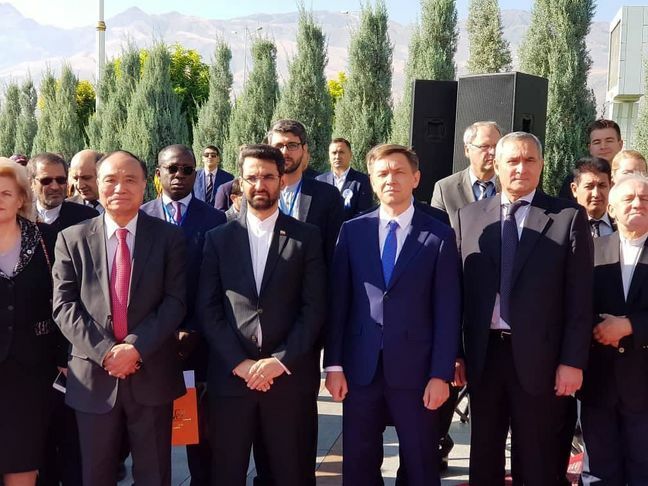 During the meeting in the Turkmen capital, members of the Regional Commonwealth in the Field of Communications (RCC) held talks with their counterparts from other countries, Iran’s ICT Ministry website reported. Following the dissolution of the Soviet Union, with the aim of preserving telecommunication collaboration, the RCC was established in 1991 in Moscow by the communications administrations of 11 countries, namely Russia, Azerbaijan, Armenia, Belarus, Kazakhstan, Kyrgyzstan, Moldova, Tajikistan, Turkmenistan, Uzbekistan, and Ukraine. Iran’s ICT Minister Mohammad Javad Azari Jahromi participated in this round of the RCC conference. He addressed the opening ceremony and held talks with his counterparts from Russia, Turkmenistan, and Azerbaijan, Financial Tribune reported. Emphasizing the strong ties between Iran and the CIS members, Jahromi said there is much room for promoting cooperation and sharing know-how. He pointed out that for a server from Iran to connect with a peer in Turkmenistan, communications need to go through nodes and ISPs in third countries, which increase costs and latency of the services, suggesting that direct communication routes need to be established. In telecommunications networks, a node is a redistribution point or a communication endpoint. He announced Tehran’s preparedness to collaborate with RCC member states to establish a regional office for coordinating joint efforts in the key ICT sector. Jahromi emphasized the importance of increasing collaboration in the field of space sciences and coordination in regulating communication protocols. The minister held talks with his Russian counterpart Konstantin Noskov on Wednesday. The two sides discussed a plan for the establishment of a joint ICT market between Iran, Azerbaijan, Russia, Turkey, and India which can offer services to an estimated 1.5 billion people. The joint market will initially be regulated by the governments and at a later stage oversight can be delegated to the private sector. He said that there is vast potential for expansion of IT and e-commerce collaboration between his country and Iran. A joint ICT commission of Iranian and Russian authorities and specialists will convene in the near future. Jahromi also called on the Turkmen Minister of Communications Bayramgeldi Ovezov. “President Hassan Rouhani and Turkmen leader Gurbanguly Berdimuhamedow have always been stalwart supporters of closer collaboration between the two countries. Hopefully, we will be able to expand our ties in ICT fields,” he said in the meeting. Azari-Jahromi invited Ovezov to visit Iran. He further said that Iran’s communication infrastructure can be tapped by Turkmenistan for data transmission; through the process, Iran will connect communication nodes from Turkmenistan to other countries. As per an agreement reached during the talks, a working group of Iranian and Turkmen specialists in the fields of ICT will be created to build closer IT collaboration. The working group will work on measures to decrease cross-border disruptions in radio communications. In order to forestall communication jams in areas where the two countries’ mobile operators’ networks overlap, the spectrum each operator is allowed to use must be determined. Jahromi extended invitations to Turkmen ICT firms to participate in Elecomp 2019, a technology exhibition which to be held in Tehran next summer. According to Jahromi, collaboration between the two countries in fields of data transit, postal services, space science, and cybersecurity are to be enhanced. Furthermore, startups from the two countries will be connected to each other. The ministers also discussed the establishment of the joint ICT market between Iran, Azerbaijan, Russia, Turkey, and India. Jahromi pointed out that Iranian firms will participate in Bakutel 2018 slated for December in Baku.